Saturday afternoon, I bumped into Brooklyn Brewery Brand Ambassador Jorge at my local Total Wine. 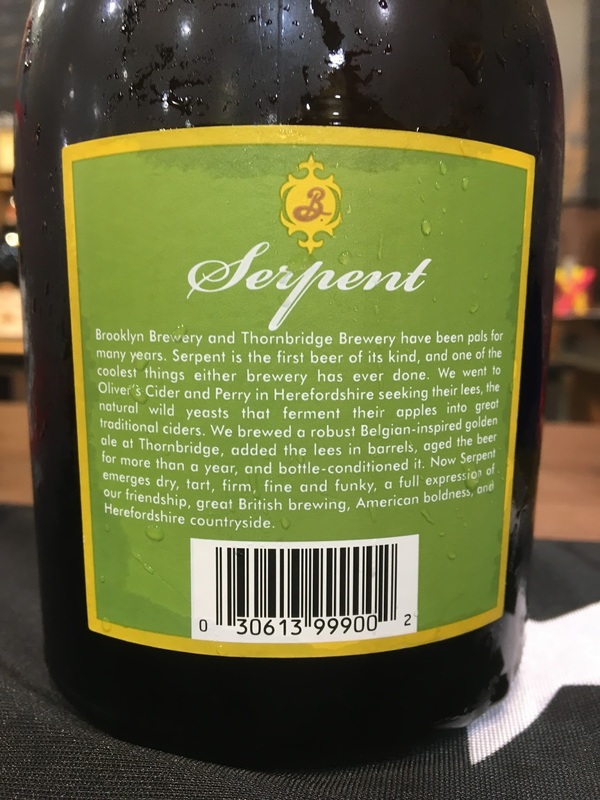 He was setting up a tasting, which he excitedly told me was to include the Brooklyn/Thornbridge collaboration beer Serpent. 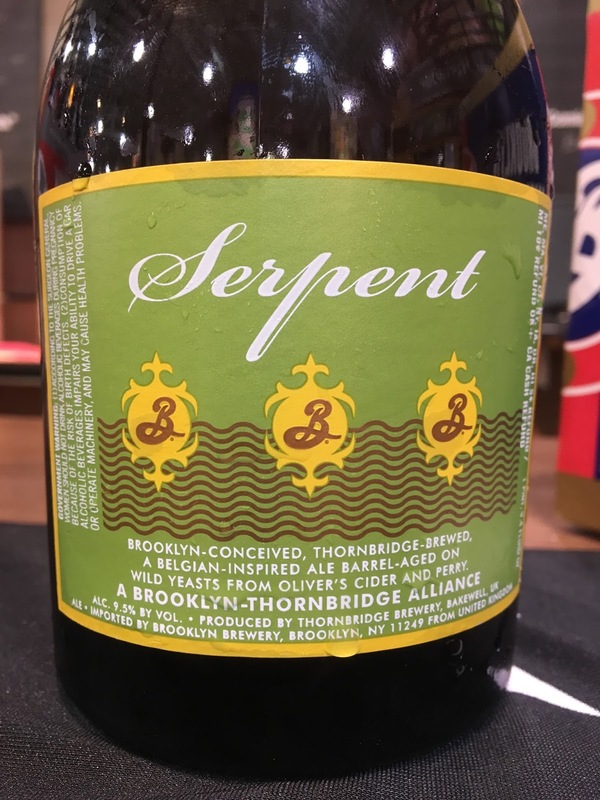 Serpent starts with the Brooklyn Local 1 Strong Golden Ale recipe. THEN... that beer was mixed with the cider lees from Oliver's Cider and Perry and aged in Four Roses bourbon barrels for two years. New yeast, those fabulous little critters. Hmmm. Anyway, to kill time while the Serpent bottle chilled, I sampled Local 1 and Local 2, two damn fine beers! Jorge and I reminisced about the Brooklyn Beer Dinner down the street at Russo's a few months back, and we both roped in some future beer geeks to check out the Brooklyn offerings. My pictures aren't awesome, but Serpent was spectacular! The fruity flavors are so awesome. Apples, peaches, pears, excellent sweetness. Creamy, beautiful texture. A little acidic, spicy, honey, and yeasty. 9.5% alcohol noticeable but an enhancer! I didn't catch any bourbon character, though I only got a few shots. The bottle is $24 ish retail. I think taking that to a party would make you King For A Day! Delicious!